Little Goose is a supplement for toddlers that accompanies our Mother Goose Time preschool curriculum. 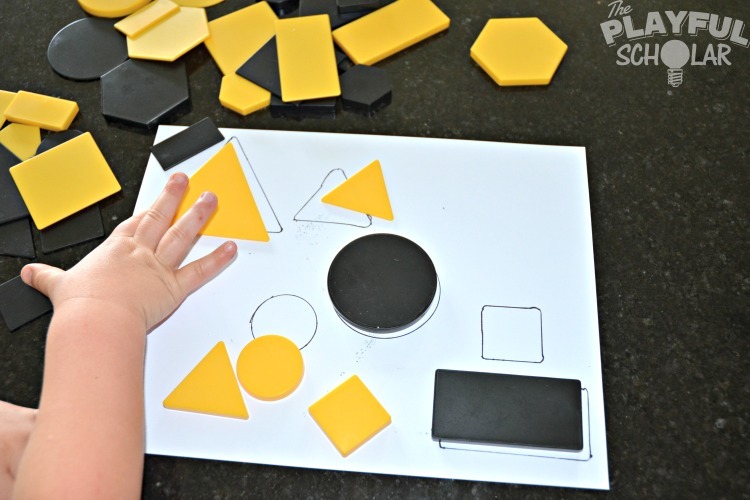 Our toddler loves the themed tray play activities that arrive each month. As an added bonus, his older brother and sister really enjoy creating the tray play activities for him! Each of these tray play activities was set up by an older sibling with a little help from Mom. They adore surprising little brother with these “games” to play. 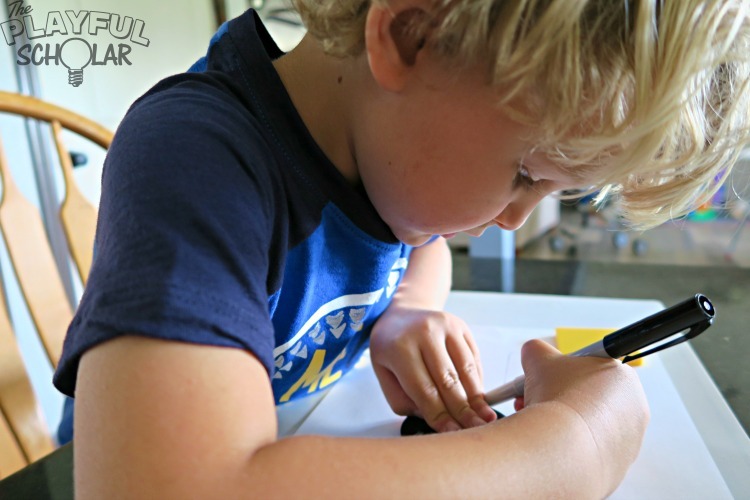 Both older kids benefit from additional practice with fine motor, scissor skills, and following basic directions. 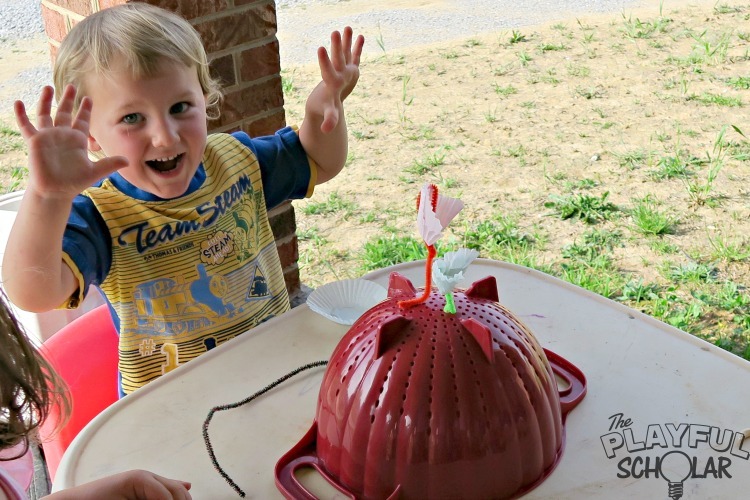 Several of these activities are also fun for the older kids to play. It is not at all unusual for all three kids to join in a tray play from Little Goose. Our fourth and youngest child is also interested in joining in on tray play. Although he has just turned one and is too young for most of them, he is already investigating the ones deemed safe enough for him to explore by Mom! 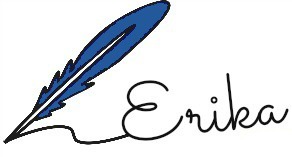 All links go to Amazon products I used for this activity. 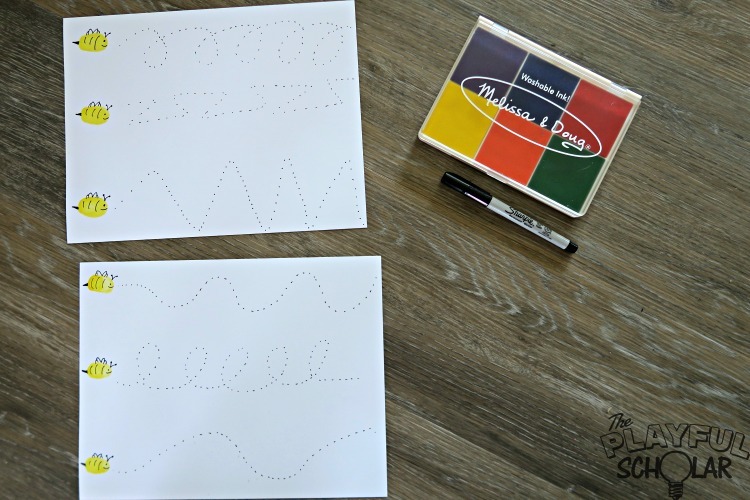 Cut strips of paper then draw dotted, zigzag, curly, wavy, and straight lines for the child to trace. 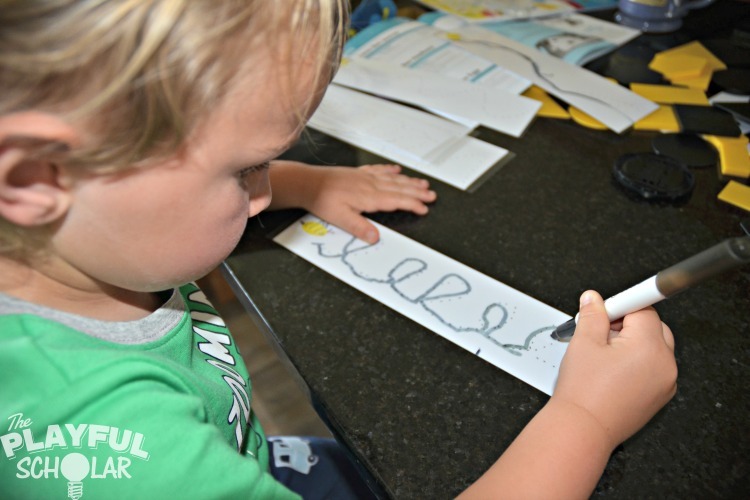 Put the paper strips and crayon on a tray. 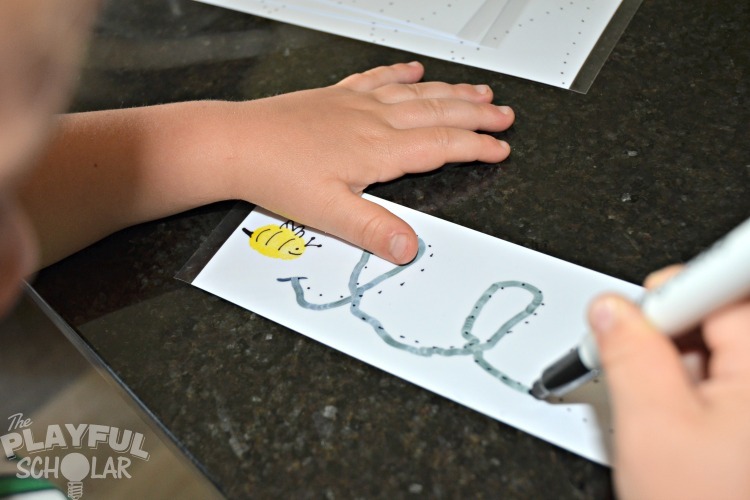 Encourage the child to select a flight path and help the bee find his way back to hive by tracing over the dotted line. My daughter couldn’t wait to set this pre-writing exercise up for her little brother. 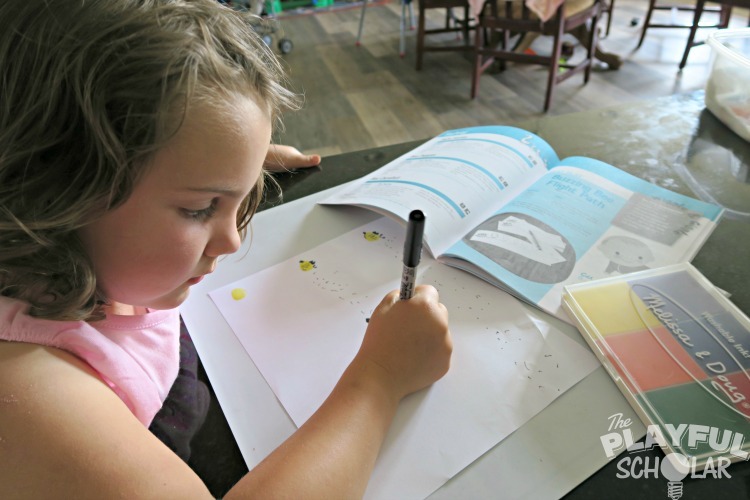 She got to use finger stamps to create the bee’s body and a permanent marker to draw his features. She also liked creating the dots for him to trace. Her brother loved that she made this just for him! He loved them so much that we ended up making more of them and laminating them, so he could play again and again. Not only is he getting some practice using a writing utensil, but he is over the moon that his big sister did this just for him! Trace around a few attribute blocks or tanagrams and make a simple puzzle. Set out a few attribute blocks or tanagrams and the puzzles. 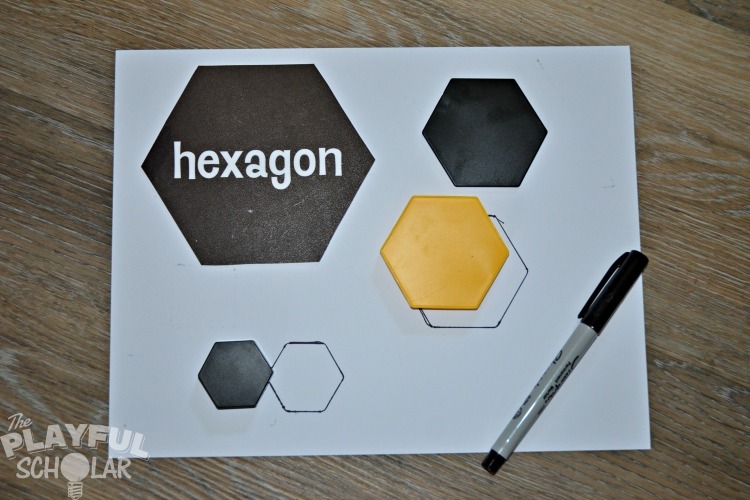 Encourage the child to match the shape to the outlines. My eldest son has always been into shapes. He loves tracing and building with tanagrams. When I gave him the chance to trace these tanagram shapes from Mother Goose Time in order to create a shape matching game for his kid brother, he was all over it! Little brother adored being able to match up the shapes. His older brother joined in the fun too! They enjoyed scavenging among the collection of tanagrams provided by Mother Goose Time for different shapes. They ended up tracing several of the shapes together in addition to matching them. Look at that little tongue stuck out in concentration! Wrap pipe cleaners around folded cupcake liners to create swallowtail butterflies. 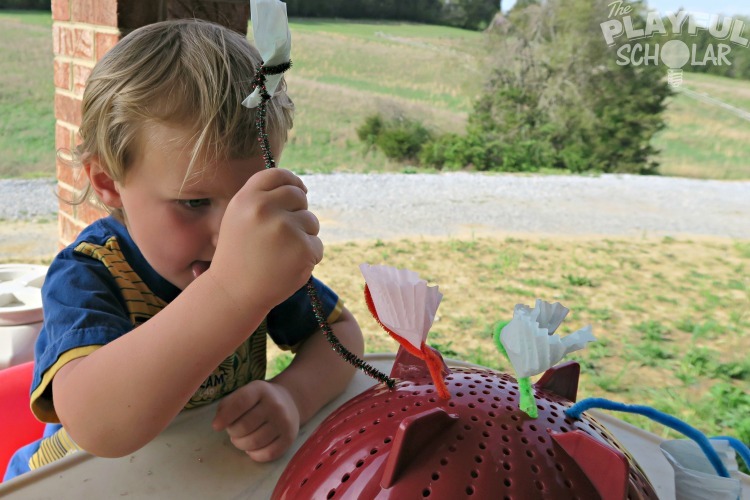 Encourage the child to stick the pipe cleaner butterflies into an upside down strainer. Play by putting the pipe cleaners in and out of the holes in the strainer. 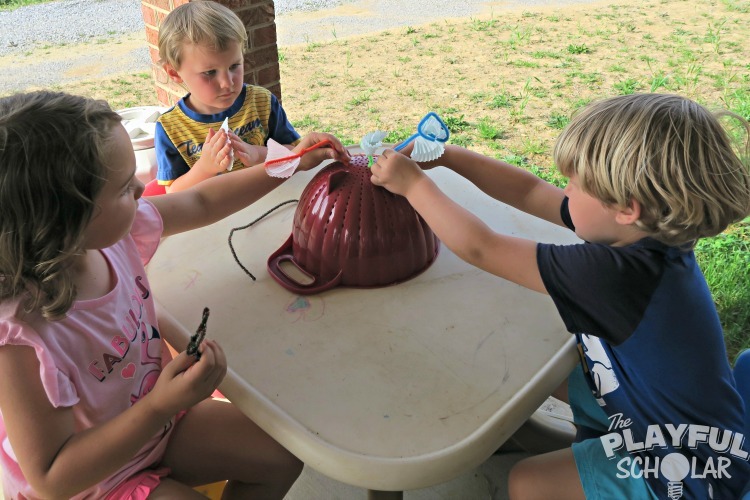 Both older siblings wanted to give this activity a go when they saw it in Mother Goose Time. The whole family loves playing with pipe cleaners or chenille stems. So, all three kids made butterflies out of the stems and cupcake liners. After placing them in the strainer, I thought the result would make a lovely, kid-approved spring decoration. 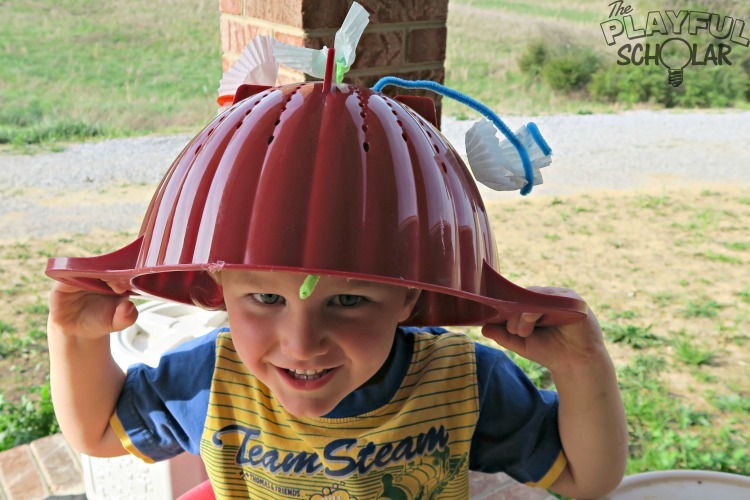 My toddler thought it worked better as a hat!